Portable vacuum cleaners are portable cleaning machines that use vacuum suction for cleaning purposes. Portable vacuum cleaners can lift dirt, dust, and other debris out of carpet, upholstery, and off of surfaces. Portable vacuum cleaners include canister cleaners, walk behind or rider sweepers, backpack cleaners, wet dry vacuums, and HEPA vacuum cleaners. Another example of a portable vacuum would be an auto vacuum, which is designed specifically for cleaning vehicle interiors. Most manufacturing facilities need portable vacuum cleaners to maintain facility cleanliness. Woodworking, metal fabrication, and other processes that create a high volume of fine powders, litter, non-free flowing media, metalworking chips, and other debris all require reliable cleanup equipment. Portable vacuum cleaners are designed with varying specifications but most portable vacuums consist of six components: an intake port; an exhaust port; an electric, gas, or air-powered motor; a fan; a filtering system; and housing. Portable vacuum cleaners offer some advantages over central vacuum systems because they can be used in places where central vacuum duct inlets are not available. They are also much more easily replaced than central vacuum systems. Variations on the size and numbers of the fans, the size of the collection enclosure, the composition of the collection enclosure, and all other manner of configuration incongruities distinguish types of vacuum cleaners from each other. All portable vacuums share in common the basic means of vacuum generation as well as the fact that they are portable. Otherwise, even within the category of upright vacuums, a host of different possible configurations provides for the diverse cleanup needs of manufacturers and other industrial and commercial users. Portable vacuums can feature agitators to help remove dirt from carpet, or they can feature unobstructed hollow hoses for removing standing water or other moisture from an area. Their collection enclosures can be made of fabric or plastic and can be separated from intake and exhaust channels by many filters or just one filter. 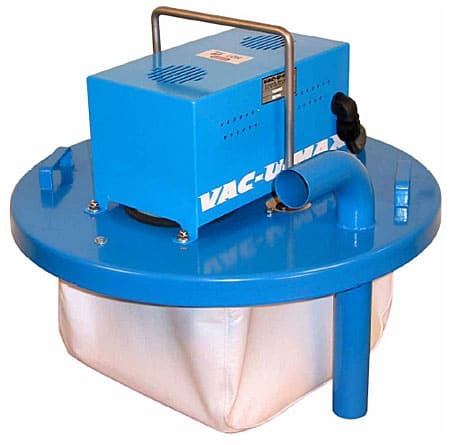 Portable Industrial Vacuums Portable industrial vacuums are industrial vacuum systems that you can move around in order to pinpoint specific areas that require cleaning.